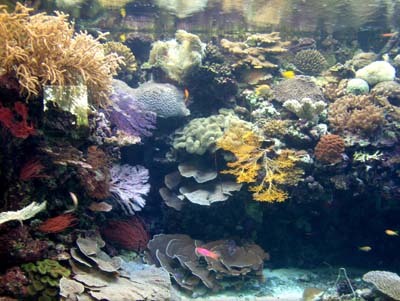 Outer Reef is part of the reef that faces the open ocean. This is where most of the popular dive sites are located. It is where the dynamic elements of the reef comes to life bringing a whole host of spectacular images that for a long time have mesmerized divers from all over the world.At the Palau Aquarium, a 5,500 gallon tank live miniaturized version of the outer reef has been created with variety of corals, soft corals and fish giving just a scale of the real thing. Surrounded by the warm tropical waters of the Western Pacific with close proximity to the Asian sub-continent, the islands of Palau have the most diverse marine flora and fauna found anywhere in Micronesia. Palau, compared to other islands of volcanic origin, has the richest and the most diverse of marine organisms. 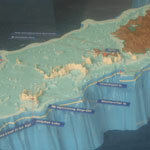 A visit to the aquarium will find a visitor poring over a detail of fine craftsmanship work as evident by the topographical map of the Palau Islands. Observe the long tentacle-like roots that emerge from the sides of the trees trunks and branches hanging down to reach the water. Catch a glimpse of the school of archerfish that readily spits out beads of water to hunt down food. Bring yourself down without getting wet, to see the upside-down jellyfish, ever pulsating on the muddy bottom of the mangrove forests. The next stop on your journey is the sea grass bed. 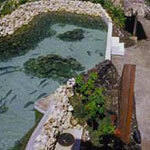 Where else can you see schools of rabbit fish feeding without putting on a mask and a snorkel? This exhibit’s only rival is the natural habitat. 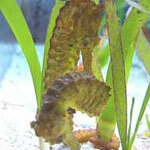 The seagrass aquarium gives you a chance to see how the animals and plants interact. Spend some time and allow yourself to catch a glimpse of the inner workings of this habitat. This interactive Touch Tank, our newest exhibit, is a fun, interactive way for children and adults to learn about marine invertebrates, such as sea cucumber and blue starfish. 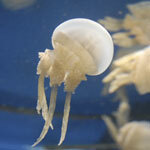 These invertebrates are safe to handle, and they each have a distinct textureâ€”from slimy and slippery to coarse and dry. 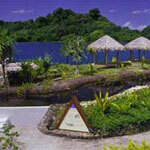 The Touch Tank Exhibit is located near picnic gazebos, and Palau Aquarium encourages families to visit, relax, and enjoy! An aquarium visit is never complete without seeing big fish. 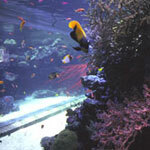 The Inner Reef aquarium is home to one of the trademarks of the reef areas – the large napoleon wrasse. A view of the water surface from the sides of the aquarium, any sport fisherman would be tempted to grab the giant trevally by the tail as it swiftly swims by. 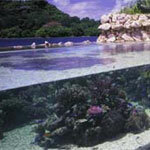 The white-tip reef shark, green turtle, giant grouper, eel and much more can be seen in this action-packed tank. 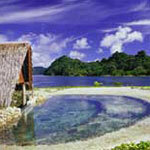 Palau is famed around the world for its clear waters and its gorgeous diversity of corals. The Reef Crest exhibit testifies to the fact that Palau is indeed the world’s underwater “Garden of Eden.” Never before has anyone seen so many of the beautiful, specially selected species of coral (polyps) feeding butterfly fish along with the envied collection of corals ever put together inside one tank. The Reef crest is a “must see” for all enthusiasts. Palau Aquarium has created the only exhibit in the world to display the lakes distinctive and famous residents – the golden Mastigia jellyfishes. Nowhere in the world can you see these unique and delicate creatures that have lost their ability to sting. The journey then takes you indoors where you will be fascinated by many rare, colorful, and exotic creatures. They are creatures from as close as the next seagrass area, and as far down where no light exists, and the inhabitants of areas with strong waves, rippling currents and constant surge action. Amazing, rare, and deep-water creatures are showcased in these themed “Creatures of the Dark and the Deep” exhibits. Start out with a close look at the inhabitants of the Deep Drop-Off where you will have your only chance to see the deep water butterfly fish, colorful dartfish, and fan corals that look too real to be true. 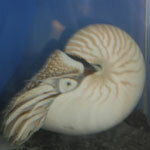 Witness a “living fossil,” the endemic Palau nautilus, and be mesmerized by the shape and the special characteristics exhibited by these ancient animals that prowl in the deep, dark ocean. Do corals fascinate you? Our Coral Biology exhibit gives you an up close view at the many different corals in our waters without running out of air to breathe. 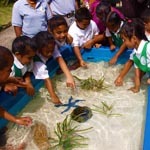 Identify corals. Indulge yourself with your favorite corals – brain corals, mushroom corals, blue corals, fire corals, cats eye corals, and much more. See the many shapes and sizes of coral polyps. 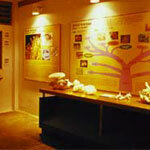 This exhibit also gives you a chance to see what a coral skeleton looks like.